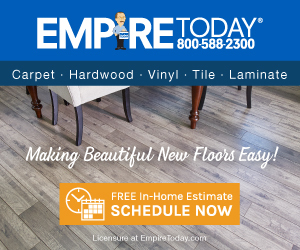 Empire Today - Communication is Important! We regret to hear about the initial delays in your installation. Our records show that we have successfully completed your installation in March, 2015. If you continue to have questions or concerns please contact us at customersupport@empiretoday.com. Lack of communication is so frustrating for a consumer. You wait and wait and wait, wasting your time and your day off. So the salesman ordered the wrong product - then fix it! The installers show up on time and find out they have the wrong product and then disappear. Hours later...no word from anybody. After assuming they were coming right back with the right product, we finally called Customer Service who said the salesman would have to come by the house and re-do the order. Waiting and waiting - no word from the salesman. Called Customer Service again - too late to schedule next-day appointment. After 4th call to Customer Service, begging them to please get this scheduled as we're extremely inconvenienced without a master bedroom, it's scheduled for 2 days later. So instead of 2 nights without a master bedroom, we have 4 nights living in an uncomfortable guest bedroom. Communication, it should be so easy! Review #606269 is a subjective opinion of User606269. Hi Sandy, thank you for bringing your concerns to our attention. We regret that your installation was not completed as scheduled, and we understand your frustration. It’s our understanding that we’ve been in contact with you and that the installation has been rescheduled. We will continue to follow up with you until everything is completed to your satisfaction, and you can also reach us at customersupport@empiretoday.com. Still not happy. The installers aren't showing up on Day 1 until 11:00, if I'm lucky. That's another 1/2 of waiting, waiting, waiting. They only have 2 days to finish this job and my confidence is extremely low.